Throughout the year we host various events to raise money for our nonprofit A Chance To Win. This nonprofit benefits those kids in the community that are at risk for bullying, drug use, and who otherwise would not be able to afford boxing lessons. Without our local sponsors, we would not be able to hold these events. April 29th Gloves Not Drugs! March friends and family month! March is Friends and Family Month! Have you ever been interested in boxing? Now is your chance! 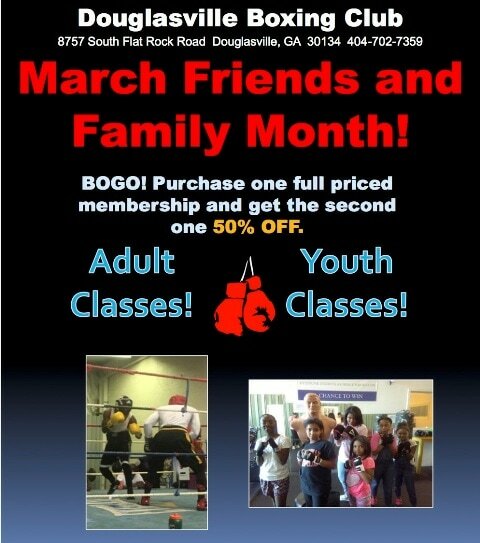 This March, bring your friends and family to Douglasville Boxing Club for our buy one membership, get the next one 50% off deal. If you sign up during the month of March, your membership rate will be discounted for the following months you are a member! We have classes for adults, teens, children, and we also offer personal training. Give us a call today at 404-702-7359 to set up your appointment! 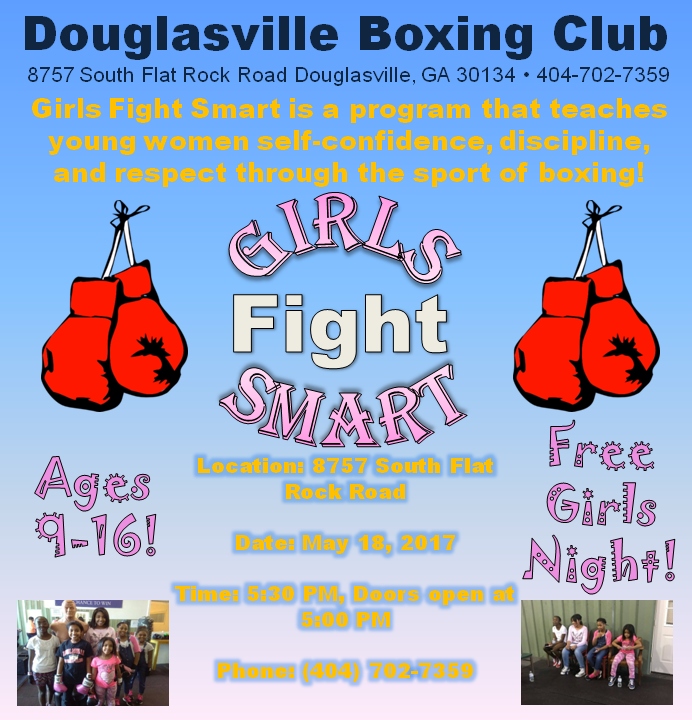 Douglasville Boxing Club's Girls Fight Smart program is now open! This program is for young women from ages 8-17. It will teach them to be disciplined, self-confident, and to respect themselves and others. 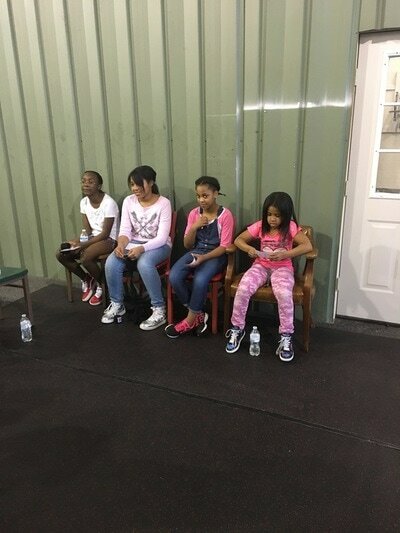 The program takes place every Tuesday and Thursday, and in addition to attending boxing classes, the girls will also participate in a "Smart Talk" session, where the girls will be mentored and have a group discussion about things they experience every day. If you sign-up during the open house on March 9th, your registration fee will be waived! Bring your daughter, little sister, cousin, niece, and friends! This is a great experience for any young woman! Gloves Not Drugs Boxing Event Feb. 25! 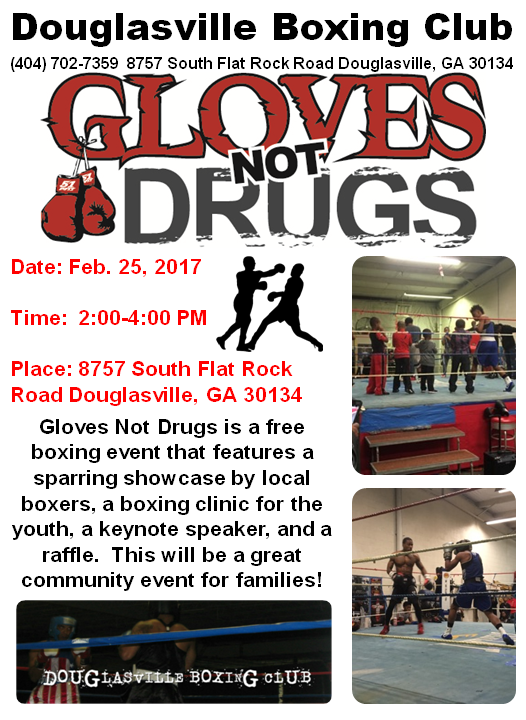 Douglasville Boxing Club is hosting its February Gloves Not Drugs Boxing Event! This is an event for kids and teens to see and participate in some boxing. 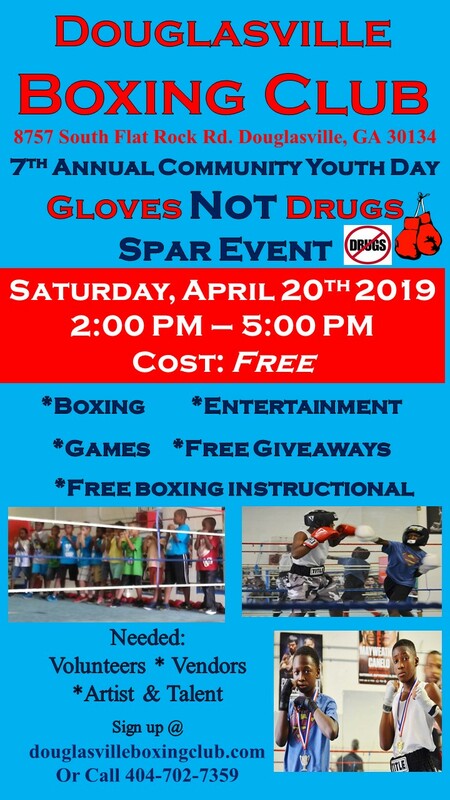 Youth and spectators will view a sparring showcase by local boxers, participate in a free boxing clinic, hear a keynote speaker, and get a chance to win prizes from the raffle! 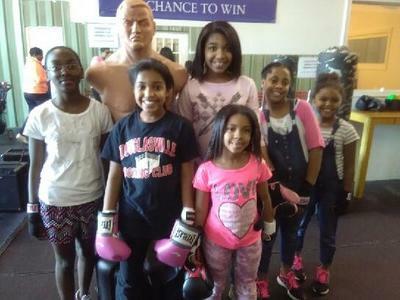 ​This is a great event to let your child come out and see if boxing is the sport for them. 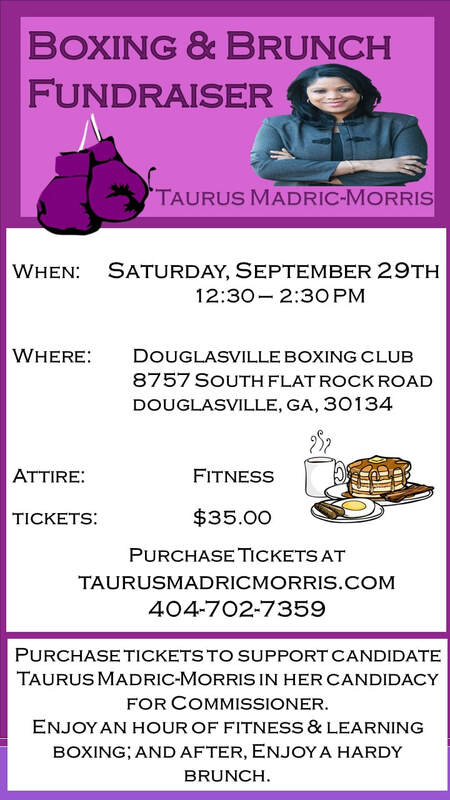 Come spend your Saturday with Douglasville Boxing Club! 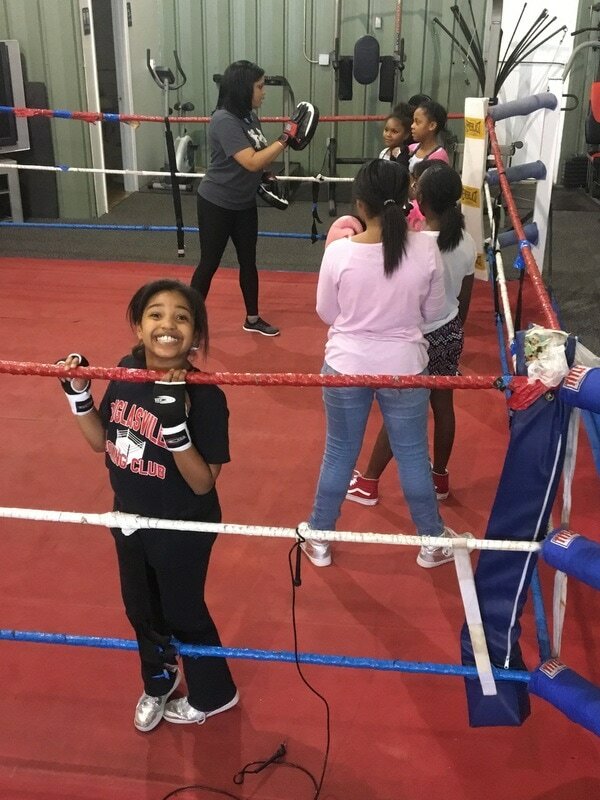 If your child would like to participate in the free boxing clinic, make sure he/she wears workout clothes and tennis shoes. 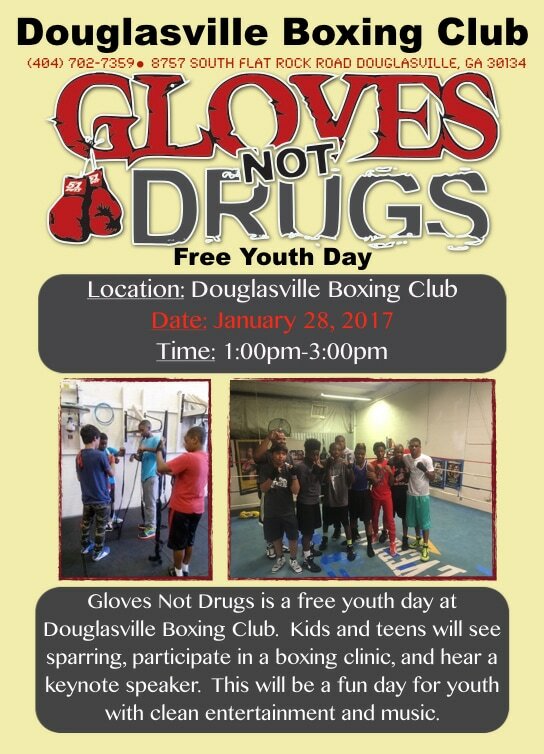 Douglasville Boxing Club is hosting another Gloves Not Dugs FREE youth day January 28, 2017. This will be a fun day filled with a sparring showcase, a boxing clinic, raffle prizes, and a keynote speaker. This event is open to teens and kids of all ages. This is a great event to come out and try some boxing FOR FREE! Bring the whole family and enjoy this fun, free Saturday afternoon. Time: 1:00pm-3:00pm, follow our Facebook page and check here for updates. 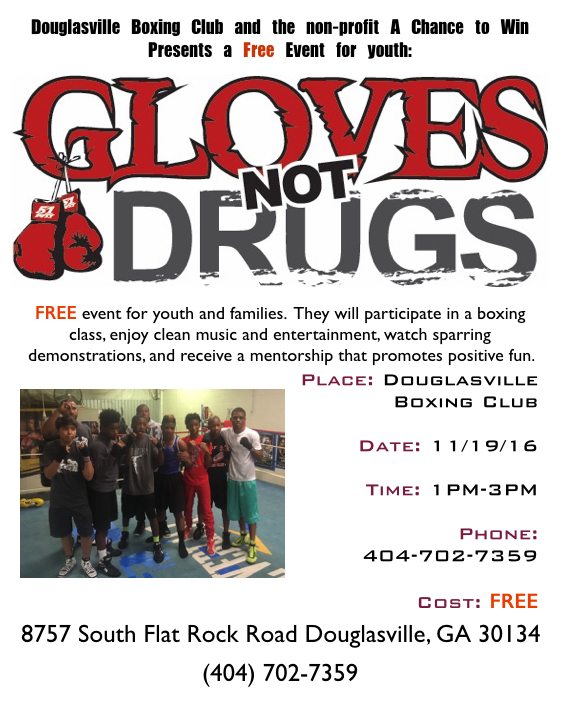 Douglasville Boxing Club is hosting a Glove Not Drugs day November 19, 2016. This is a FREE event open to families with children and teens of all ages. The day will feature a sparring showcase by local amateur boxers. 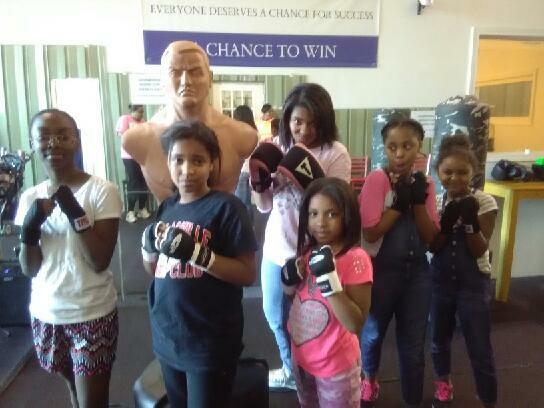 Youth will also participate in a boxing class, a mentoring group, and they will enjoy clean music and entertainment. 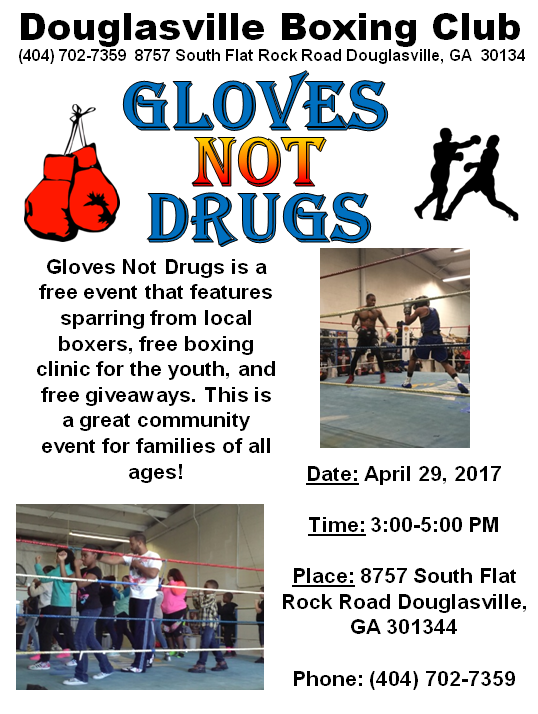 Gloves Not Drugs Youth Night is our free youth nights that involve guest speakers, mentors, boxing coaches, and an environment that allows youth to have open discussion about scenarios going on in their world. We make these youth nights fun, by also playing icebreaker games, giving away prizes and building a bond amongst teens that teaches them to hold each other accountable. They are then pulled in the ring for one on one attention with a boxing coach and taught the basic principles of boxing and how it ties into to their everyday situations. 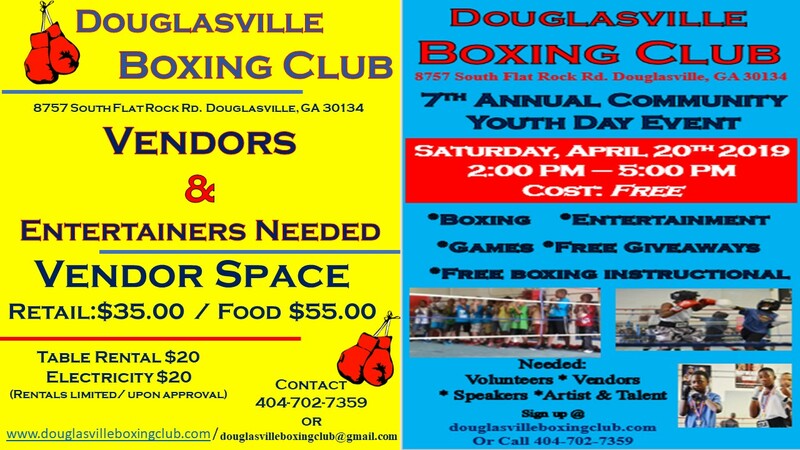 Douglasville Boxing Club has partnered with the nonprofit organization A Chance To Win, to expand in opening a Teen Center. The Teen Center is to promote positive fun for teens. Teenagers plan chaperoned Teen Nights which are party themed, focusing on positive fun. A Chance To Win, Is always looking for teens to plan the next Teen Night, Express themselves on the New Teen Talk Show, or to join the Teen Counsel which plans positive fun in the community for other teenagers. You can visit achancetowinforteens.com for additional information on programs and fun offered for teens in the Douglasville Community. 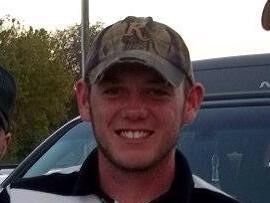 Dylan Conger was born June 27, 1992 in Atlanta, Ga. Growing as a child into his high school years Dylan was involved in every sport possible. 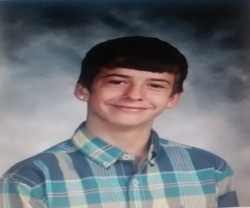 After high school Dylan became bored because his time was no longer consumed by the activities so he started hanging around the wrong crowd, so Dylan started drinking and doing drugs. Over the past few years Dylan had became more depressed which lead him to become more and more lenient to those drugs. On May 16, 2015 Dylan became so angry that he took his own life. 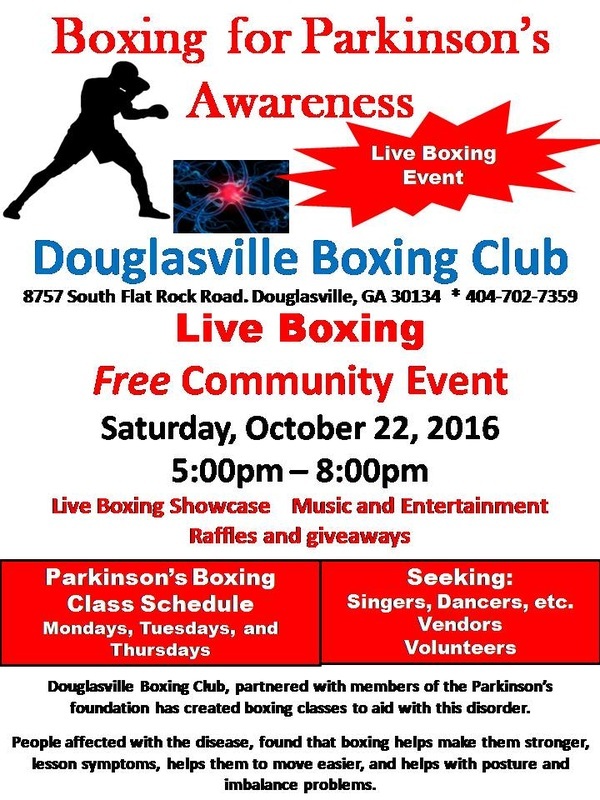 The Ramsey Family partnered with Douglasville Boxing Club to celebrate the memory of their loved one, Travis Ramsey. They wanted to make a positive impact on the community so they along with Douglasville Boxing Club decided to give a fundraiser that would raise funds for a scholarship program for teenagers who cannot afford membership dues. 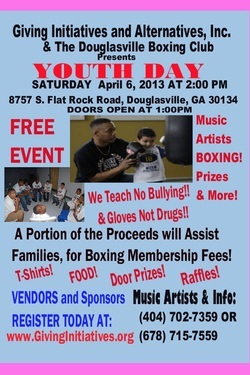 Giving Initiatives and Alternatives partnered with Douglasville Boxing in a Youth Day fundraising event to raise funds for G.I.A's youth group membership dues. Together they were able to give away three scholarships to the young men of The Boys Camp.